A four-day festival in Mt. Angel featuring music, food, dress and beverages of Bavaria. The event is used to help raise funds for non-profits and community activities in the Mt. Angel area and each year brings more than 300,000 people to the festival. The Steel Visitor Center is at the Crater Lake National Park headquarters and offers a 18-minute film, free advice about how best to enjoy Crater Lake, and has a post office. Boat fragment was found and towed to Newport, Oregon, where it is moored at a marina. Inside were found -- more than four years and 4,000 miles later, if officials' suspicions are correct -- some specimens of a variety of yellowtail jack fish normally found in Japanese waters. 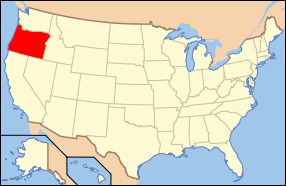 The state of Oregon is located with the Pacific Northwest area of the United States and is bordered by Washington to its north, California on its south, Nevada on its southeast, Idaho on its east, and the Pacific Ocean to its west. Most of the states northern and eastern boundaries are made up of the Columbia and Snake Rivers. The land where present day Oregon is located was initially inhabited by many indigenous tribes, it wasn't until later in 1843 when settlers formed a government. 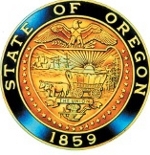 In 1848, the Oregon Territory was created and the state became the 33rd state admitted into the U.S. In February of 1859. Oregon is the 9th ranked most extensive state with a total land area of 98,381 square miles, as well as the 27th ranked most populated state with a population of 3.87 million as of 201. The state capital is the city of Salem, however the states most populated city is Portland. The state of Oregon consists of a very diversified landscape which includes the Pacific Coastline, Cascade Mountain Range, numerous waterfalls, evergreen forests, and high deserts in the eastern region of the state. Oregon only has one national park which is Crater Lake National Park. The major industries in Oregon include paper products, wheat and cattle farming, timber, coal mining, electronics, and computer equipment. There are several major bodies of water in the state including the Columbia River, Willamette River, Deschutes, Snake River, John Day River, Crater Lake, and Upper Klamath Lake. The highest point of elevation in the state is Mount Hood which sits at 11,239 feet above sea level. The state nickname is the “Beaver State” and the state motto is “She Flies With Her Own Wings”. The state bird is the Western Meadowlark, the state animal is the American Beaver, the state fish is the Chinook Salmon, the state flower is the Oregon Grape, and the state tree is the Douglas Fir Tree. Given the diverse landscape and geography of the state paired with its strong industry, Oregon continues to attract people across the country for leisure and business ventures. Geologists warn that 60 miles into the ocean water lies the Cascadia fault, which generates earthquakes as powerful as Japan's 9.0 tremor around every 240 years. And the last one was 311 years ago. If we do not prepare, we have nobody to blame but ourselves. On May 5, 1945, six people were killed by a Japanese bomb that exploded on Gearhart Mountain near the Oregon Coast. This is the only fatal attack on the United States mainland committed by a foreign nation since the Mexican–American War, making Oregon the only U.S. state that has experienced fatal casualties by a foreign army since 1848, as Hawaii was not yet a state when Pearl Harbor was attacked in 1941.